How about a bit of black lace to spice up your Monday? 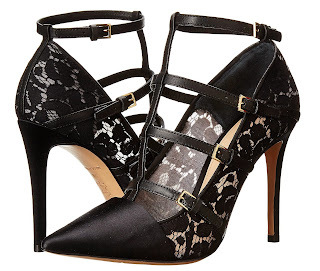 We love the combination of the sensual lace paired with the leather cage silhouette in today's Shoe of the Day. Black lace has been making waves and not just after hours. We love seeing the dark hued fabric during the daytime hours like with this edgy Tory Burch Sutton 100mm Pump. This not-so-classic pump boasts a patterned floral lace and satin-trimmed upper, pointy leather cap toe, cage silhouette encloses the foot with straps up to the ankle, and a wrapped 4" heel. Take your look flawlessly from day to night for $375.00 on zappos.com.